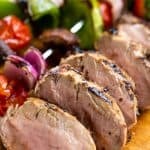 Perfectly Juicy Grilled Pork Tenderloin requires just a few ingredients and a few minutes of prep for the juiciest, flavorful pork tenderloin straight off the grill. It’s just so good! What is the difference between pork tenderloin and pork loin? Pork loin is a large, lean piece of meat cut from the back area. It is commonly sold boneless, but can also be purchased bone in. It is best suited for cooking over a medium heat, or slow roasted in the oven. Pork tenderloin is a small, thin strip of meat that comes from the backbone area. It is always sold boneless and only weighs 1 to 1 1/2 pounds. Pork tenderloin is the most tender cut of pork. It is best suited for quick cooking using high heat. Pork tenderloin and pork loin cannot be used interchangeably. How long does it take to grill Pork Tenderloin? Pork tenderloins are all roughly 1 to 1/2 pounds and take approximately 15 minutes to cook over a high heat of about 400 degrees Fahrenheit. Pork needs to be cooked to an internal temperature of 145 degrees Fahrenheit. Use a meat thermometer for accuracy. Can pork tenderloin be a little pink? Yes! And it actually SHOULD be a pale pink color in the middle. The USDA now recommends that pork be cooked to an internal temperature of 145 degrees Fahrenheit , where previously it was 165 degrees Fahrenheit. At 145 degrees Fahrenheit you will have the juiciest pork tenderloin possible which will be a pale shade of pink in the center, but still fully safe to eat. Pork tenderloin that is not pink in the middle has been overcooked and can easily dry out. Watch the video below where Rachel will walk you through every step of this recipe. Sometimes it helps to have a visual, and we’ve always got you covered with our cooking show. You can find the complete collection of recipes on YouTube, Facebook Watch, or our Facebook Page, or right here on our website with their corresponding recipes. 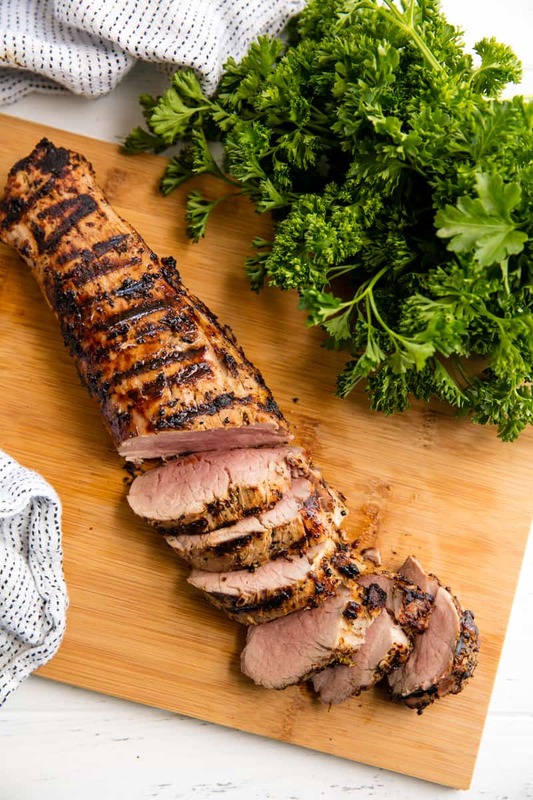 Perfectly Juicy Grilled Pork Tenderloin requires just a few ingredients and a few minutes of prep for the juiciest, flavorful pork tenderloin straight off the grill. It's just so good! Trim the tenderloin of any excess fat and silver skin. Rub with dijon mustard. In a small bowl, mix together salt, pepper, and Italian seasoning. Sprinkle over tenderloin. Preheat an outdoor grill to high heat, 450 to 500 degrees F.
Place tenderloin directly over high heat to grill 15 minutes (with the lid closed), rotating every 2 to 3 minutes. If pork begins to blacken too much, remove to indirect heat to finish cooking. 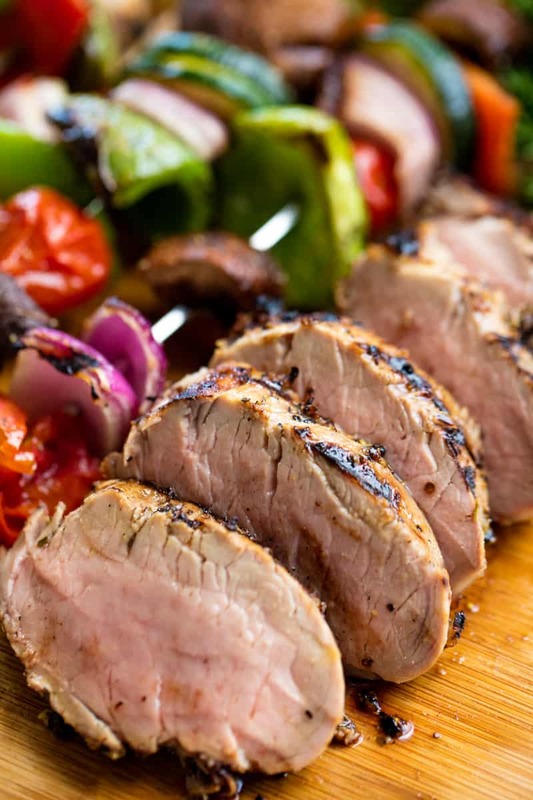 Remove the pork tenderloin from the grill when it reaches an internal temperature of 145 degrees F. Let pork rest 10 minutes before slicing and serving. Join my newsletter and get new mouth watering recipes sent directly to you weekly!